The colder weather brings the citrus fruit! Hooray for late autumn mandarins!! They are so sweet and juicy and such a perfect snack for children. And so bursting with the right kind of vitamins to help combat the winter sniffles. They are the best thing, I find, for a pick-me-up in the morning and for satisfying the sugar cravings in the late afternoon. I didn’t find what I was looking for so I made a recipe up. It was a bit of a hotch-potch of ingredients, but a delicious one! I’ve recently learned that chia seeds mixed with water can be used instead of egg as a binder, so I ground up some white chia seeds into a fine powder and mixed 2 tbsp of that with a cup of water. I think it was enough to replace maybe 4 or 5 eggs? In any case our cake turned out quite moist. I’m not sure the addition of chia seeds is legal on the GAPS diet, but I ate a little of this today with no noticeable reaction, so perhaps from time to time it may be ok. The mandarins were boiled in their skins for a few hours, and as the skins are used in this recipe along with the flesh I think it is pretty important that organic mandarins are used. I cheated a bit for the mandarins on the topping. I had a tin of mandarin segments in the cupboard and I’ve been wanting to use them for ages, so they became the topping to the upside-down cake. I don’t see why you couldn’t use pipped fresh mandarins, or even boil up 2 extras and whizz them all up together, saving some of the mandarin pulp to use as the topping. 3 organic mandarins, plus 2 more for decorating (or 1 tin of mandarin segments). Boil three whole (washed and unpeeled) mandarins, completely covered by water for 2 hours. I tipped out the water halfway through and topped up the pot with fresh water because I thought the skins might get a little bitter from this treatment. Not sure if it made a difference but they certainly were not bitter in the end. 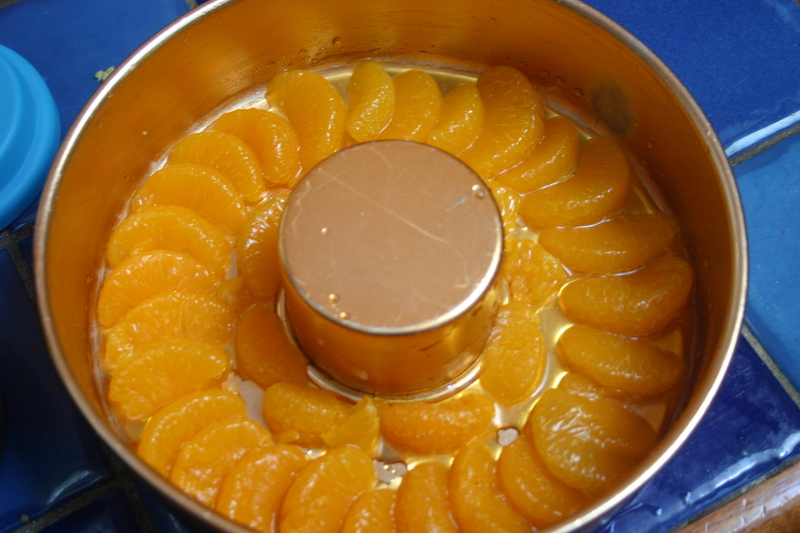 Drain and cool the mandarins, then blend them. Take the pips out if you want to – I just blended the whole lot up, skins, pips and all, into a pulp in the food processor. Add sweetener, ground chia seeds, water and coconut oil to the mandarin and blend again. Add the dates, almond meal and hazelnut meal and blend until smooth. Grease a ring tine with coconut oil. Drizzle a little maple syrup into the base. 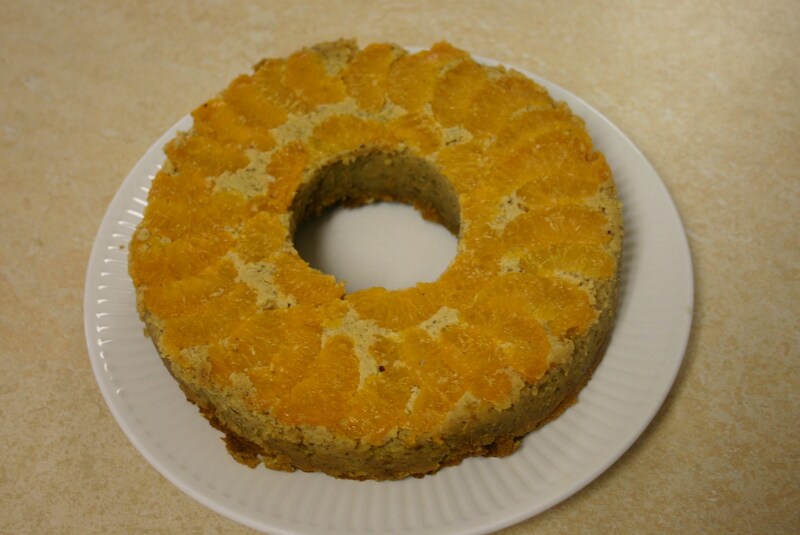 Lay out the spare mandarin segments, then pour the cake mixture over the top. Bake at 180C until firm. This took about 40 minutes for my cake. It did go quite brown on the top but was still moist in the middle.